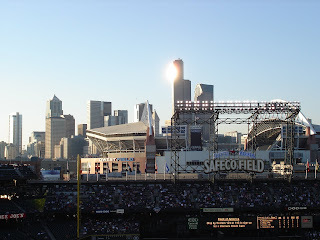 This past Friday we ventured out to the Mariners game. Despite the cold, loosing the game, and lack of attendance from my brothers and a few other UT people I miss a lot it was a great summer night in Seattle. I'm sorry. It would have been fun to be watching the game with you. Ben and I were out flying. If it's any consolation we did have a good flight. You ought to consider it. We'll catch the next one with you.